Let's hope the forecasters are correct and the weather this weekend is as glorious as predicted. Uncover your barbecue, get your lawn mower out, blow up your paddling pool, pack a picnic, lay on the sun lounger, gorge yourself on eggs. Whatever you choose to do, have a lovely relaxing few days. Happy Easter from everyone at Fox Estates. HAS BREXIT AFFECTED ESTATE AGENTS? THE ANSWER IS YES, IN VERY UNEXPECTED WAYS! As reported in the Property Industry EYE. Brexit unrest spilled over into an estate agents' training course in the middle of London. Delegates had to leave possessions behind when demonstrators entered the building in The Sanctuary, Westminster, where Propertymark has its London offices. News reports subsequently said the protesters got into the building with no difficulty and went from floor to floor, with only one security officer seemingly around, as they tried to find the Attorney General's office. He apparently was not at his desk at the time, so escaped the disruption. However, the NAEA course members were not so lucky. NAEA boss Mark Hayward told EYE yesterday: "All delegates will be given a credit to attend an additional course and we are awaiting a suitable date from the trainer. All personal belongings left in the building are being returned to the delegates by post." The protesters were targeting the Attorney General offices who occupy a part of the highly prestigious building. 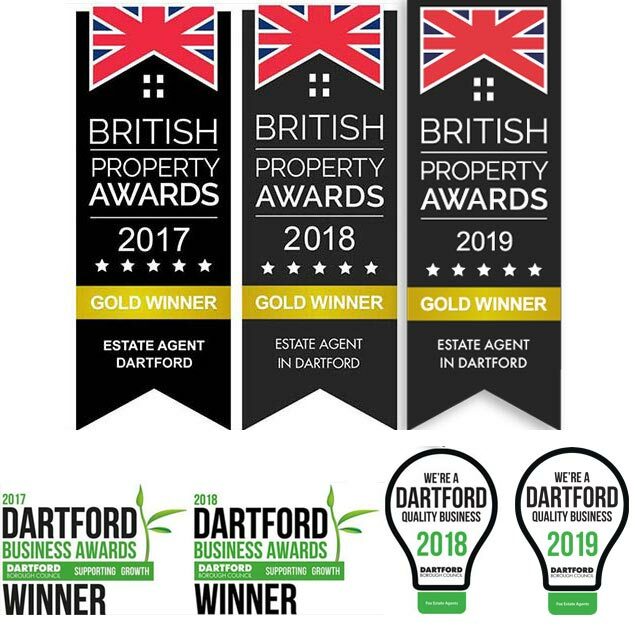 We are thrilled and delighted to announce we have won the British Property Award for the best estate agent in Dartford for the third consecutive year! This Gold Award is based totally on a series of secret shopping calls and is awarded for exceptional customer service. Members of the British Property Awards team phone estate agents in Dartford and ask various questions about different properties. It could be that they request a viewing on a property for sale, under offer or one that's marked sold, subject to contract. The agent is then marked on the various ways they deal with these requests. Also, agents are tested on how quickly they respond to emails and missed phone calls. Mostly, agents are assessed on how friendly, knowledgeable, professional and helpful they are. I personally took a call from a gentleman from the Wirral who requested to view of one of our properties. We immediately struck up a rapport, which is essential as it means we can deliver a very personal service, and I ascertained he was moving down here because he had just accepted a new job. It was his first foray into buying property and he asked for any help we could give him. After explaining that he needed a solicitors conveyancing quote, as even though he had a vague idea what his budget was, he didn't realise that the cost of conveyancing would be coming out of his budget. I recommended a good, reliable solicitor to him. He also mentioned that he'd worked out for himself what his budget for buying a property was but hadn't actually spoken to a broker. I spent some time explaining how he really needed to speak to an independent broker as they would take into consideration all his finances and work out what his budget would be. They would also reinforce the advice I'd already given him about how he would need an Agreement in Principle as this would leave him in a strong position should he ever put an offer in on a property. After a very pleasant chat, the gentleman said he'd call me back regarding the time of his viewing on the property he liked as he needed to make sure his boss would give him the time off. Despite numerous messages left and emails sent, that bounced back, that was the last I heard from him. Soon enough, we had a call from the British Property Awards, to say we had won the award again. It seems our caller was another mystery shopper. The example is just one of the calls we were judged on but it reinforces that the customer service we give is second to none as apparently, every box that could be ticked regarding that particular mystery call, was ticked! Fox Estate Agents are very proud of the customer service we provide. It is essential that we give our clients a good, responsible, reliable, individual and friendly experience as most of our business comes from personal recommendations. Increasingly, we are also gaining business from our Google reviews. Our customers have given us over eighty, five star ratings, of which we are extremely proud of. Fox Estate Agents is based on integrity, commitment, honesty, loyalty and approachability and this is why we are so successful and winning such prestigious awards. WILL HOUSE PRICES FALL DUE TO BREXIT? If you're selling a property, be sensible about your asking price. Your agent has experience so listen to him and remember, if the price of your property falls, in theory, so will all the other property prices. First time buyers should be in a good position to buy, assuming they have their deposit and Mortgage in Principle in place. We've all been listening to the gloomy Brexit predictions but with over forty years in the property sales business, I've seen markets rise and fall, plus I've experienced the hysterical predictions of entering Europe in the first place. My advice is get yourself a great agent, listen to the advice given and DON'T PANIC! People will still want and need to move, so houses will still sell. People have to live somewhere!